You spend a Sunday tidying up and realise you have accumulated a bigger stash of samples than you expected. In the last few weeks I decided to tackle the pile and get testing. I can’t give you a lengthy review but I can provide first impressions and let you know if I would part with my cash on the full size. Natracare Cleansing make up removal wipe – Makeup wipes are not something I buy for myself but I have sampled a few over the years. I found Natracare to be pretty average in terms of texture and performance. I'd suggest they may be worth a try if you like this type of product and want a "greener" alternative. Amala Jasmine Hydrating cream cleanser – this didn't win me over I've tried a million identical cleansers and for the high end price tag I am not sure it is worth it. 100% Pure kelp & mint volumizing shampoo & super fruits reparative cream – I have mixed feelings about this brand because they incorporate Japanese Honeysuckle in their products. I liked the cream but the shampoo did nothing for me. John Masters Organics rose & apricot antioxidant day crème – a pleasure to use but sadly the scent wasn't quite right, perhaps my sample was old or maybe I was having an off day. 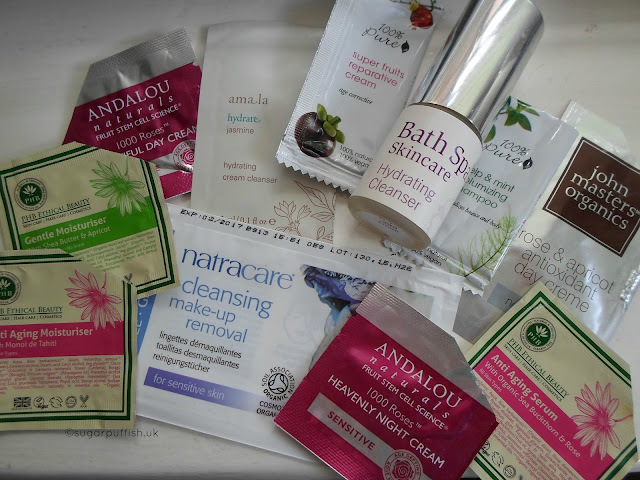 Andalou Naturals 1000 Roses Beautiful Day Cream & Heavenly Night Cream –I really enjoyed both these creams and they felt nice on my skin. As someone who dislikes rose scents I actually didn't mind these. I have considered buying full sizes. PHB Ethical Beauty Anti Ageing Moisturiser & Serum – these were winners for me, I liked how they left my skin feeling nice and silky soft. I was totally won over by the scent because Monoi de Tahiti is a tropical delight which I can’t resist. I have considered buying full sizes. PHB Ethical Beauty Gentle Moisturiser – another great cream and ideal for those who need a scent free product. I have considered buying full size. Bath Spa Skincare Hydrating Cleanser – I enjoyed using this and cream cleansers are not my daily go to. The only minor downside was the scent just didn't sit well with me. Disclaimer - these samples were provided either direct from brands, event goodie bags or GWP from orders I have placed. Wow you've gotten through loads! All my samples from Nat Products Show are still in the bag...oops! Have started using the serum & moisturiser though from Bath Spa. Going to try some tonight now you've reminded me! The Andalou Naturals products sound lovely. Must check them out.